My wife and I have been (sort of) vegetarian for twenty years now. I say “sort of” because we do eat fish regularly, and we’re not obsessive about avoiding foods that might have animal stock in them. More simply, we avoid eating meat. However I often find it hard to explain this to people, partly because it doesn’t seem to fit with anyone’s standard notion of vegetarianism. Reaction tend to fall somewhere between being weirded out by the idea of a diet that’s not based on meat to a detailed quizzing of how I decide which creatures I’m willing to eat. The trouble is, our decision to avoid meat isn’t based on a concern for animals at all. The reason we went meat-free many years ago was threefold: it’s cheaper, healthier and better for the planet. Once we’d done it, we also found ourselves eating a more varied and flavourful diet, but that was really just a nice side-effect. The “better for the planet” part was based on several years of reading about issues in global equity and food production, which I have found hard to explain to people in a succinct way. In other words, yes, it would require me to be boring for an entire evening’s dinner party, which I would prefer not to do. Nice. I’m currently going through Mike Berners-Lee’s “How Bad are Bananas”, and I found there’s one additional point to bring up here: where your food comes from and how was it grown matters a lot, too. So for instance, in this graph, tomatoes do pretty good. And they *are* pretty good, assuming you get them in season and fairly locally. If you get them air-freighted or locally from hot houses, which is almost certainly what you need to do out of season, they’re one of the most carbon intensive foods there are. Nice to see a graph like this, but as Jorge has already noted, it really doesn’t tell the whole story. Tuna performs better than other meats on this graph, presumably not taking into account the overwhelming and unsustainable fishing practices done to get the meat. While the overfishing may not emit a lot of carbon directly — I’d expect that the effect on the ocean’s ecosystems — and hence their role as a carbon sink — would be quite significant. @Elizabeth: yeah, carbon footprint analysis really addresses only a small part of the sustainability question. Somewhere I have a leaflet that lists all the different fish, and suggests which ones to avoid and which ones to eat, based on a variety of sustainability factors. But I never have it ready to hand when I’m ordering dinner, and it’s too complex to memorize. Oh, and then the waitstaff can’t reliably answer the questions anyway (e.g. is your shrimp farmed or wild?). 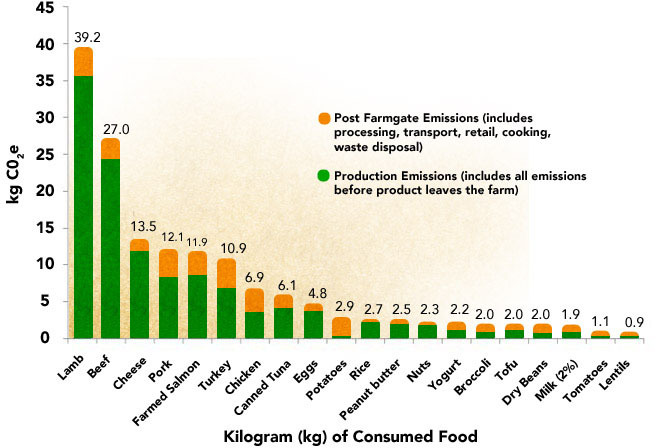 I think the order of magnitude lessons in a graph like the one above matter, as does the attempt to increase awareness of how destructive some of our food production industries are. The detail in the graph? No so much. In the long run, most of these problems can never be solved by relying on individuals to make informed choices. The destructive practices need to be stopped by some combination of regulation and tax penalties. Nasty vs fluffy… doesn’t necessarily help analyse the problem, but it’s how a lot of people think about the food system. E.g. transition movement: massively biased towards food issues, but rarely if ever considers it as an economic problem, which – as well as being an ecological and social problem – it definitely is. But do you eat cheese? I did, a lot, when I was vegetarian. Wonderful presentation. Thanks. Also some foods are chemically intensive. Some leave a toxic after-glow I hear that farmed shrimp can ruin lands after a few harvests. Mushrooms might be best, since they feast on anything and don’t need chemical support. Data visualization is nicely done, more please. Nice visualisation, but it leaves me asking, whats so bad about lamb? Being Irish, conditions here are fairly benign, and sheep and cattle are left out in the pasture for a lot longer than other countries (I don’t believe Irish sheep are ever housed / fed indoors, cattle are in the wintertime), so the cost is purely pasture: how come the CO2 cost is so high? I’m not an expert, but again from Berners-Lee’s book, lamb is particularly bad because (a) like cows, sheep ruminate, so they belch lots of methane, and (b) they’re very inefficient at converting food into meat—partly because they’re out in the pasture and in the hills, going up and down, a lot of the time. Yes, but good luck converting moorland grasses into any other sort of food. I think you’re right, but perhaps thats not the best thing to do with moorlands. At least here, they’re fairly efficient CO2 absorbers (its a stong part of the case for preserving bogs in Ireland). Perhaps greater intensification of lowland farming is a better bet. Thank you, that is an interesting and informative graph. Something I would find interesting would be the relationship between the carbon dioxide emissions and the caloric food value of those same products. And compare hand and mechanical harvesting values. Which common food products will rank best, or worst? I really wish they would do this over and compare grams of protein within the various foods: A kilogram of cheese is just not comparable to a kilogram of milk from a nutritional point of view. Once you notice that, many other questions arise. Is eating potatoes better than eating eggs? Only if you don’t mind the thinning hair and lack of concentration that come with a starchy, low-protein diet. Me too, but it’s complicated: on the nutrition side, we could compare calories, proteins, vitamins, fats, etc etc. On the ecological side, there’s CO2-equivalent emissions, changes in land use, and variations between production at different latitudes. So it may be best to keep it simple, use charts like the one above as a rough approximation, and use your judgment.